What you are with what you were. You must learn to choose between. Two, is as if they had never been. This can often be deeply true in real life. I’ve only once revisited the town of Gosport where I grew up, and found it very changed. A small harbour town, it was adequately affluent in the 1960s: naval and military presence gave high employment for civilian workers. For instance, my grandfather and stepfather both worked in the aircraft repair yard, my uncle Ken in Portsmouth dockyard. This role has declined, and apart from a few glossy marina developments at the harbour, the place looked distinctly shabby, with many shops closed and converted to unremarkable residential developments. It has become a dormitory town. I’ve explored it with Google Maps, and here are a few views near the street where I lived as a boy: here was a corner chemist and a wool shop called Lacey’s; here was a pub whose name I forget; here was Burden’s, the sweet shop; here was Franklands, the grocer; here was a coal yard with horses. You get the picture. I was passing through, however, for an even more significant act of returning. My parents divorced when I was a baby, and I had no memories of my natural father, who lives in Newport, Isle of Wight. Five years ago, after a lot of exploratory correspondence, one of my sisters (half-sisters, technically) arranged a family reunion, and we went to meet him. That’s a story in itself. It’s sufficient to say that we were completely unprepared for the kind and cheerful elderly man who came to the door – the complete opposite of everything I’d been told about him by my mother. The significant history was that he was in the Gloucester Regiment in the Korean War, and a survivor of the Battle of Imjin River, one of the group in a Chinese prison camp for two years. It seems likely that he came back with problems, in an era where such problems were not acknowledged. Anyhow, whatever he was like in the past, that’s gone. The reunion was successful, and we go back regularly. During our visits, it has been natural to re-explore the Isle of Wight, where my mother and grandmother often took me to visit relatives. A number of things about it carried very strong memories that I was worried of spoiling; Portsmouth harbour station; the ferry trip across; the long pier at Ryde; my great aunt’s house by Carisbrooke church; and the chalk downs, cliffs, and chines (small clifftop ravines) of the Island itself. It turned out there was nothing to fear. Portsmouth harbour front has been stunningly redeveloped; it’s better than I remember. The ferry – now a FastCat – still goes to Ryde pier, which isn’t much changed. Amazingly, my great aunt turned out to be still alive, thoroughly compos mentis, and still in the same house. We’ve had many pleasant chats since, and I got to apologise to one of her sons for stranding him in the middle of Southampton during a day trip! The Island is still beautiful; I especially enjoy its southern coastline, whose landscape is very like the Jurassic Coast nearer home. 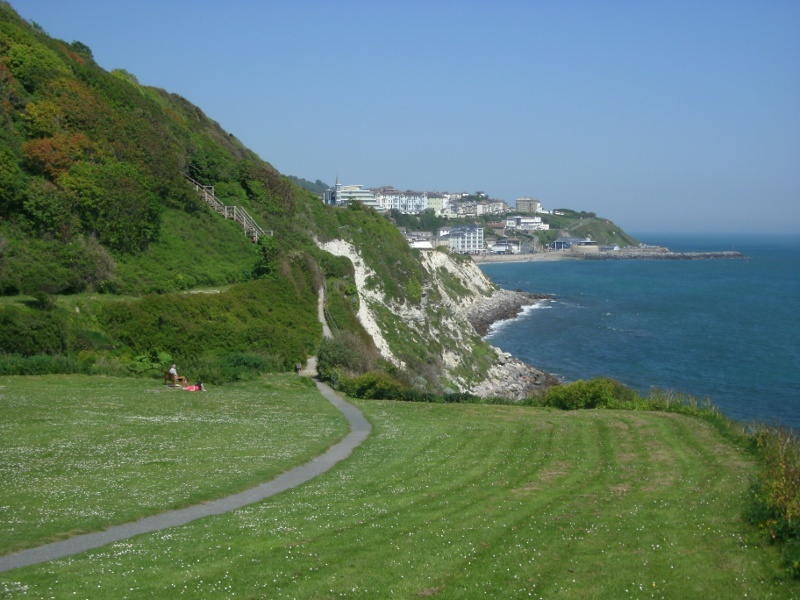 For a small island, it’s surprising how it still contains secluded and mysterious spots: little-visited paths and ravines, and even a segment of ‘lost road’ on borrowed time in the middle of the Undercliff landslip. and its name too implies both bank and stream. The poem is online in full at the poetry journal Poezibao: here. Cliffside woodland walk – Isle of Wight. Video by “Porph”. Musings from a fierce mind. Naked Lobster: A soft vulnerable creature which is easily eaten. A novel.